Music Education: What Instrument is Right for Your Child? There are many benefits to adding musical instruction to your child’s education, which is why many children start learning to play instruments as early as elementary school. Students who study music learn about teamwork, discipline, creativity and self-confidence. Furthermore, studies have shown that students who play instruments tend to do better in math, and studying music is a great way to improve fine motor skills. Regardless of whether your child becomes the next great composer or simply develops an enriching pastime, there is plenty of fun and growth to be had! Another consideration is how physically suited your child is to a particular instrument. 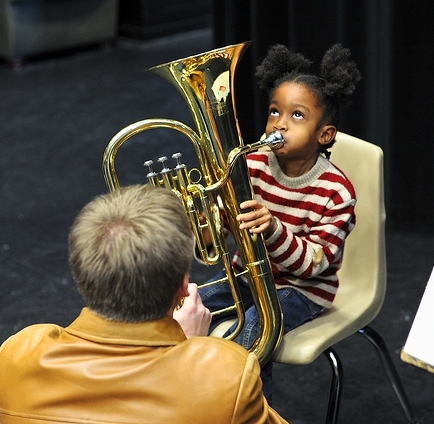 While even small-statured children can successfully play large instruments like the baritone, bass, and tuba, depending on the structure of your school and where your child will be taking lessons you might need to consider how your child will carry their instrument. Additionally, some children grow more slowly than others. Their hands may be too small to play certain keyed brass and woodwind instruments at an age when their classmates are beginning to study music. If your child is very determined to play one of these instruments, wait a year and let him or her start when they have grown a little more. In the meantime, perhaps let your youngster learn musical theory on a keyboard or affordable recorder; if your kids are not yet in elementary school, you can spur their early interest with playful children’s musical instruments provided by West Music or aBaby. Choosing an instrument for your child to study is a big decision. If you take some time to consider what your family can afford, your youngling’s build and personality and the practicalities of your living situation, you can guide your child towards a musical instrument that will enhance his or her life for years to come. Learning to play an instrument gives children a sense of pride, outlet for their emotions, valuable problem-solving skills and a creative inclination that establishes a priceless foundation for future development. So let the music playing begin! That is good advice about musical instruments for children. I’m thinking of giving my grandchildren a keyboard for Christmas and hoping at least one of them will enjoy that and making learn piano. The oldest one is playing recorder right now. Nice post, Dawn! Really great stuff here. Thanks f or sharing valuable article. My boys love music. So far they only have toy instruments but they love playing them and singing too! both love playing with guitar they have but have not yet started learning and practicing an instrument. I will look and see if one is available in our area.